20 Foot Inflatable Outdoor Movie Screen & Projector | San Diego Kids Party Rentals | water slide and bounce house | San Diego Kids Party Rentals | bounce house rentals in San Diego and Rancho Santa Fe, CA. The Professional 20' x 11' Outdoor Movie Screen and Projection System is designed to comfortably accommodate 500 viewers. It's a favorite of resorts, Parks & Recreation Departments, Home Owner Associations, Military use, etc. 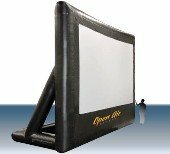 The 20-Foot inflatable outdoor movie screen is theatrical quality, yet lightweight and sturdy.The movie screen has a lightweight frame so that it is free-standing and allows theatre-quality movie projection. Most of the audio/visual movie projector components are conveniently installed pre-connected into a custom hardshell carrying case, which makes it easy for San Diego Kids' Party Rentals to operate a brilliant-looking and rich-sounding outdoor movie cinema. The inflatable screen provides 23' of movie viewing space (measured diagonally) and comfortably fits audiences of up to 500 people on blankets, 1,000 in closely arranged chairs, or 3,000 if they are standing together. Movies are Great for Theme Parties!!! Just pair a movie with other movie-themed character entertainers, bounce houses, and decorations and it's so much more than just a movie night -- it's a movie-palooza!! !